This entry was posted on 17th January 2019 by WoodBlocX. If all gardens were flat they would be very boring! That’s not to say a flat garden is boring, but many of us have gardens with challenging terrains, slopes and sheer drops to contend with. 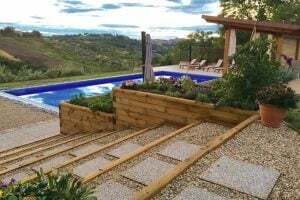 This is where garden retaining walls come into play, and there are many benefits of retaining walls; from simply serving the purpose of retaining an area of earth or to landscape a garden creating flat platforms and interesting focal points. 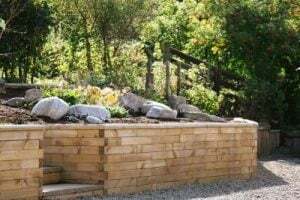 There are already many styles of retaining walls in the UK so there are lots of different options you can go for. Our modular system has proved very popular with customers looking for an alternative to brick, stone, gabions and railway sleeper retaining walls. 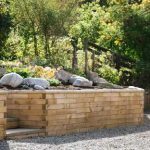 Below we’ve provided a rundown of the materials you can use to build retaining walls in your garden and how the WoodBlocX™ retaining wall stacks up against them. Brick and stone retaining walls are a common choice, but these materials can prove very expensive and need regular maintenance. You will need to include foundations to build on to create a stable structure. To build it yourself would really be a challenge, you need to ensure the bricks are laid straight and level and the mortar mix is correct. If you’re not experienced in bricklaying it is best to enlist the help of a skilled tradesperson. This can be costly and is another added expense you wouldn't get with a DIY product. Gabion retaining walls are made using gabion baskets and cages. They provide a more industrial look and are generally used for retaining earth where water is close by and for extremely high retaining walls. No foundations are needed with gabions, but you will need some heavy individual stones to fill the baskets which can be very hard if you are building by yourself. 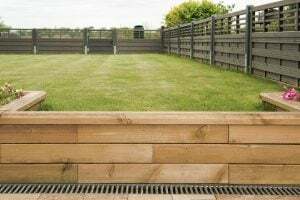 Railway sleeper retaining walls are popular and single lengths of railway sleepers can be used to build a wood retaining wall for the garden; but the individual pieces can be very large and heavy. To secure the lengths in place you will need reinforcing bars and a large drill bit to create the holes for the bars. The old treated sleepers contain harmful chemicals too, which can have an unpleasant odour and leach into the soil. New untreated versions are available, but they will become susceptible to rot after only a few years. 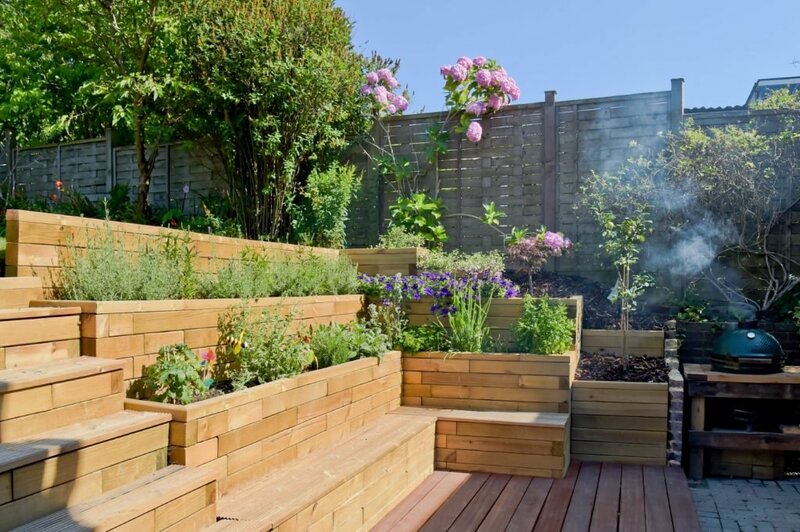 WoodBlocX™ supplies wooden/timber retaining walls for the garden. 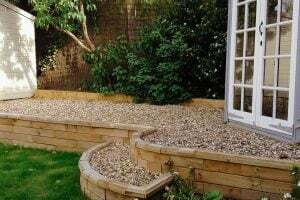 The quick-to-build retaining walls offer a fantastic alternative to brick, stone, gabion and railway sleepers. 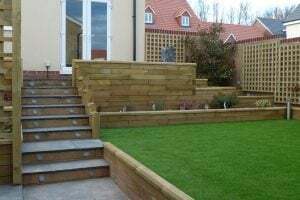 Our retaining walls are the natural and beautiful choice for landscaping your garden, and with everything you need supplied directly to your door there’s no need for foundations or substantial groundworks to build the walls. The BlocX™ themselves are light and easy to handle and building requires no heavy lifting. WoodBlocX™ use wood from sustainable sources and we only use a water-based preservative. You can rest assured that your new easy to build retaining wall is eco-friendly, and suitable for organic growing too. WoodBlocX™ can help you with your next project with our free design service; either speak to our team of designers who will work with you to create something that is totally bespoke to your garden or use our new retaining wall calculator which will give you an instant price for the size of retaining wall that you need. We provide a full retaining wall building design guide and general instructions with all purchases. 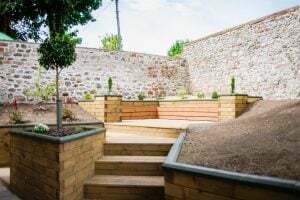 For retaining wall ideas and design guides and to see how to build a garden retaining wall using WoodBlocX™, simply head over to the retaining wall section on the website or speak to one of our friendly customer service team on 0800 389 1420 if you have any questions. For more helpful garden tips and inspiration check out our blog page, and to find out more about our timber raised beds, planters, walls, garden furniture, ponds and more all made in Great Britain, head to our home page.